This is a 3 month late post, but I wanted to share what I made on New Years Day. (Happy 2015 + 3 months!) I have a remote problem. This is well known. I have a TV remote, a Cable remote, a Blu-ray remote and a Roku remote. I can never find the one I need under my fabric piles and I had about 1 lb of rice leftover from the heating packs I made so I decided to make a remote holder! It’s super easy and can be customized to meet your needs. -Decide how big you want your base to be. Mine was about 1 yard cut in half. BASE:-sandwich fabrics right sides down with a same size piece of batting between and sew 3 sides and part of the 4th so it has an opening you can pull inside out. Top stitch all edges and this will close the hole where you pulled it through. 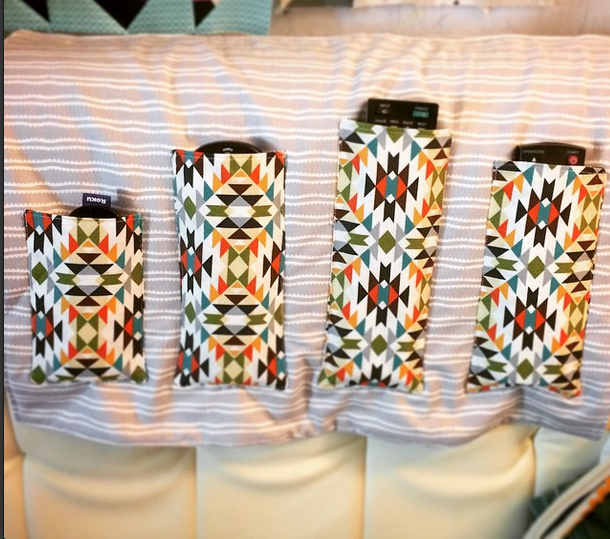 REMOTE POCKETS: Measure your remotes; I made the pockets bigger than necessary to accommodate the depth of them. Just be sure your pockets will hold the remotes, if you take width and depth measurements, just make sure you add about 1-2″ extra. You probably don’t need to make the pockets as long as I made mine, so keep that in mind as well. Cut your pockets and layer them right sides together (no batting necessary); turn right side out and top stitch to close hole. RICE WEIGHT: Make a rice weight that is the same length as the top of your base and roughly 12″ wide; fold over and sew right sides together, turn inside out and set aside. ASSEMBLE: Sew pockets on the base in the center lower part of it. (this is a good time to make sure your remotes fit!). Sew the weight pocket to the top back of the base so it can go over the top of your couch. Fill with Rice and handstitch closed. I hope these instructions were clear-ish. It’s pretty freeform so whatever works for you! Posted in Non-Quilts, TutorialTagged scraps, southwestern, tutorialBookmark the permalink.